September 2018, Bountiful Utah - BlueIQ, developers of the practice analytics platform that gathers data from multiple sources, announced the release of Insights, a new graphical display of scheduling data specifically designed for team huddles, helping dental teams drive production by focusing on key appointments. Insights provides dental teams with a simple display of the day’s schedule to review key metrics and specific appointments that need attention in order to preserve or boost production. When the team meets regularly, BlueIQ’s Insights helps every member understand what appointments need additional attention and what actions they can take to build growth. 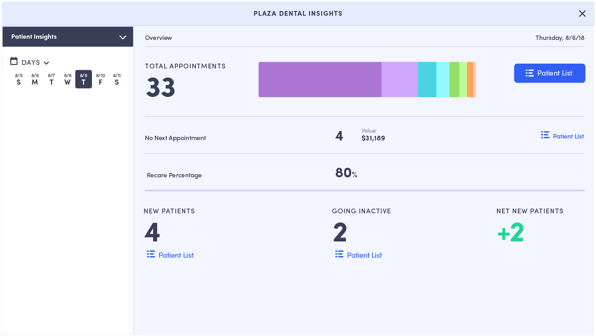 Insights is a part of BlueIQ’s dental business platform, which includes data analytics, patient communication tools, and custom reporting tools. BlueIQ’s Insights displays the total number of appointments for the day, by location and with the total value of all appointments. BlueIQ will also show how many of the appointments are new patients and recare appointments and their value. With one click, the team can view a list of patients falling under each category of patients, which provides additional perspective. For example, the team is able to identify patients with balances and the total value of those balances, incomplete treatment plans and their value, patients with expired insurance, and patients who are missing key documents, like a HIPAA agreement. One unique Insights feature allows the team to view data from the previous day, the current day, tomorrow, or any day of the month.